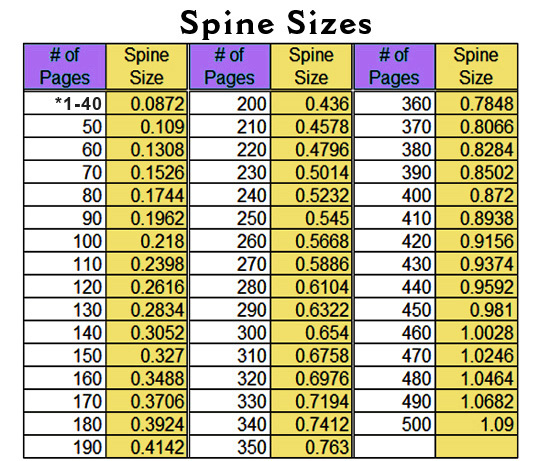 *Please note the spine size for books with 1-40 pages. And it's not suggested to print on the spine for books with less than 60 pages. Please provide all cover files as tiff, eps or pdf files in CMYK colors at 300 dpi. If you are trying to match colors please use the pantone uncoated numbers and submit those numbers with your order and take the proof option for color matching. Custom sizes and bleeds available, you will be charged for the next size up on the pricing calculator and you will be responsible for layout of your special sizes.